Submitted by via David Lock ... on Wed, 23/05/2018 - 12:46. 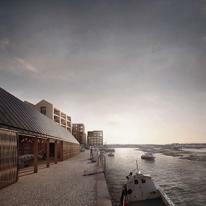 Plans for a mixed-use scheme to regenerate Hayle Harbour have been submitted to Cornwall Council by David Lock Associates, on behalf of Sennybridge (Hayle) Ltd. An application to revitalise Hayle’s North Quay was originally given outline planning permission in 2010, and the current application now progresses the detail for the quayside on behalf of Sennybridge (Hayle) Ltd. The detailed scheme, designed by Feilden Clegg Bradley Studios, provides for 175 dwellings, new waterside workspaces, restaurants, shop units and a new public square at Hayle’s North Quay. North Quay is located within the UNESCO World Heritage Site. The proposals have been developed in consultation with Cornwall Council, Hayle Town Council, the World Heritage Team and Historic England, and embraces the industrial heritage of the port to create a contemporary harbourside area for living, working and recreation. A public exhibition of the draft proposals was held in November 2016 and received a warm response from visiting members of the public.